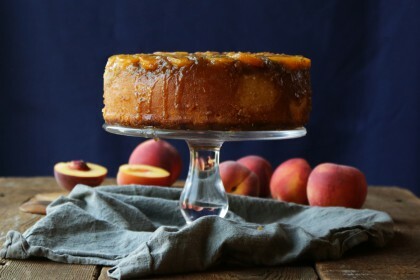 Peaches: Melt the butter over low heat in a medium sized saute pan and whisk in the brown sugar until completely combined. 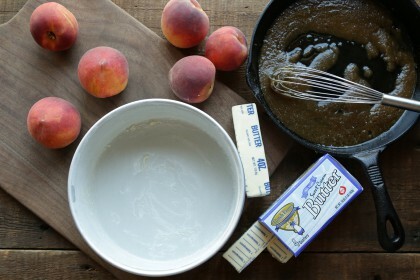 Pour the mixture into a buttered and floured 8 inch cake pan (2 inch deep) and evenly layer/fan the peaches until they are used up. Set the pan aside. Cake: In a standing mixer with the paddle attachment cream together the butter and sugar. 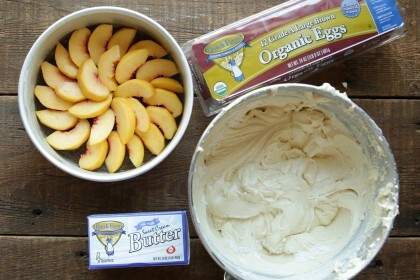 Once it is whipped add in the vanilla and eggs one at a time. Stop and scrape in between eggs. In a separate large bowl whisk together the flour, baking powder and salt until combined and add it to the creamed butter-sugar mixture alternating with the milk. Alternate with the milk beginning with the dry ingredients and ending with the dry ingredients. Stop and scrap often. 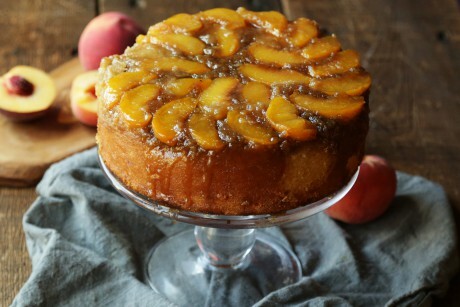 Pour the cake batter over top of the peaches in the prepared cake pan and bake at 350° for 70 to 80 minutes. 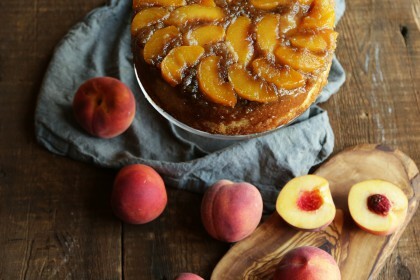 Let the cake cool for 20 minutes before flipping it over onto your serving dish.